The map is an equidistant projection and has a scale of 2.5 miles (4 kilometers) per pixel. Actual resolution varies greatly across the map, with the best coverage (close to the map scale) along the equator near the center of the map at 180 degrees west longitude. The lowest resolution coverage can be seen in the northern mid-latitudes on the sub-Saturn hemisphere. 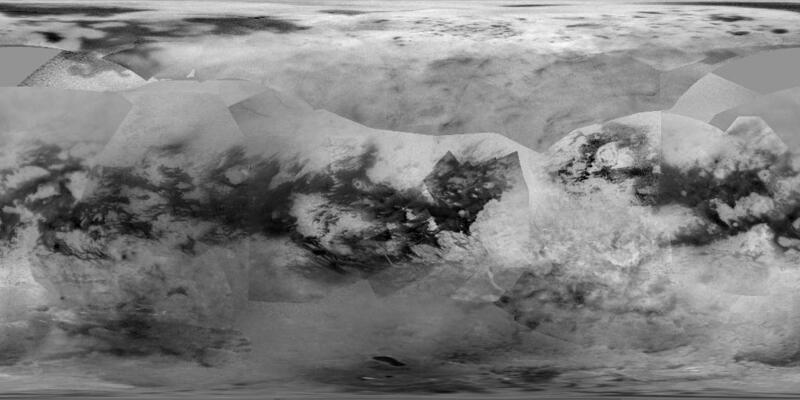 The uniform gray area in the northern hemisphere indicates a gap in the imaging coverage of Titan's surface, to date. The missing data will be imaged by Cassini during flybys on December 15, 2016 and March 5, 2017.